However, in my experience there have been many patients that don’t seem to get back to their full function after a shoulder injury despite the scapula strengthening and the down and back shoulder packing. In my search for answers I came across Eric Cressey‘s blog several times. Where most clinicians are terrified of allowing a shoulder to elevate due to the Upper Trap/Lower Trap ratio that we were taught to fear, Cressey advocates the opposite. He trains many of his clients in an overhead position with an emphasis on upward rotation using the trapezius. Does the statement above bother you? Bring up some defensive arguments? It did for me when I first heard it. I’ve been cueing people with “back and down” for years. However, once I got past my ego and opened up to this concept my shoulder patients started to get MUCH better. While this upper trap/overhead concept may not be brand new or fully original to Eric Cressey (I know Sahrmann is an advocate of this); he is the first I’ve heard to discuss it with such clarity and clinical relevance. Most of the time when you hear about a new concept it’s really just somebody trying to sell something or someone just offering an interesting perspective with no clinical solutions. However, Cressey not only helps to define this paradigm shift, but he also offers detailed strategies to address it (for free!). Much of this post series, especially the assessment & intervention (part II), is based upon Cressey’s work. It’s important to note that this isn’t just a protocol you blindly apply to everyone. It’s a detailed concept that requires an individualized assessment to determine if they need more upward rotation (and where they need to get it from). 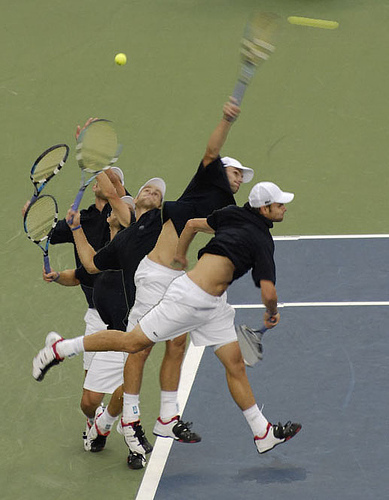 Why is Overhead Position Important? 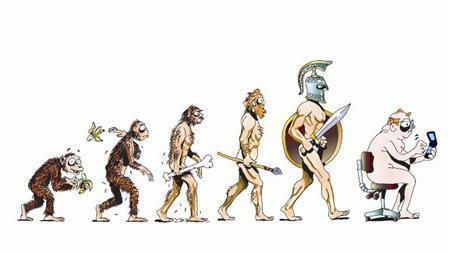 Our current species of the hominin is starting to de-volve. To understand this, we have to look at where we came from. First when we used to live in the trees our shoulders were oriented upward and forward. Then when the climate changed and we were forced to our bipedal states in the savanna, our shoulders re-oriented less upward and more forward to manipulate objects. Next, to increase our hunting prowess our shoulders re-oriented more laterally facing to allow us to throw objects at our prey. Now, with all the use of technology and poor postures our shoulders are starting to regress back to facing more forwrard. The FMS/SFMA had it right with the overhead squat assessment. For more reasons than I realized. Being able to get both arms overhead without compensatory patterns is a sign of great shoulder function. If you have any pain, restrictions, weaknesses, or dysfunctional movement patterns you will not be able to do this. The same cannot be said for non-overhead shoulder positions. Even if you don’t buy into the last two, you can’t argue with this one. Most of our patients love to participate in recreational activities and exercise. For these patients to return to such activities they need to display good overhead shoulder mechanics. You can’t just have them doing sidelying ER and expect them to go out and hit a tennis serve without problems. Even if they’re not athletes they’ll need it for everyday tasks of putting dishes away, washing your hair, hailing a cab, slapping someone taller, etc. 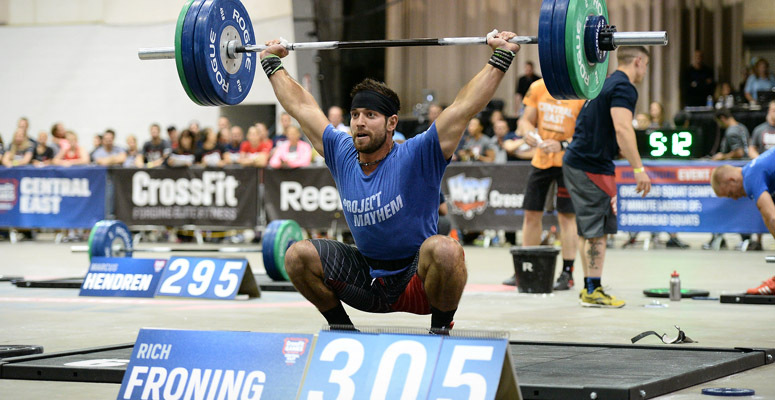 What is Required for the Overhead Shoulder Position? Before you can assess and correct the overhead shoulder, you first must truly understand what goes into an overhead shoulder. Each of these things have their own complexity and should not be underestimated. What You Get When You Train Overhead? A cascade of events occur when you lift your arm to the full overhead position with a proper movement pattern. From a simple perspective it strengthens the upward rotators and lengthens the downward rotators. Full scapula upward rotation is paramount (increased GH congruency in overhead position). However, it’s much more complex than just upward/downward rotation. First it’s important to understand that most people only have about 170 degrees of pure shoulder flexion. Often time they’ll cheat with lumbar/T-L junction hyperextension to get to the full 180. But if you can teach your patients not to cheat and to actively get to a stable compensatory free full overhead shoulder position, a lot of good things will occur. So what happens when you try to go for the full 180? A cascade of events occurs leading to a stable shoulder position with activated thoracic extensors, scapula stabilizers, rotator cuff, and anterior core. Long Lever + High COG over Small BOS = Inherent Instability = Reactive Stability. Plus, adding a compressive load gets the reflexive stabilization of the RTC and scapula in this great position. Is the Upper Trapezius Really a Problem? The poor upper trap. It gets blamed for everything. People often say that it’s too tight and too active. Historically many people have tried to decrease the upper trapezius tone by spending a ton of manual therapy and stretches to “loosen” them up. Then they try force the little lower trapezius and serratus anterior to do all of the upward rotation work. The problem is that the upper trapezius should be considered with the opposite point of view. 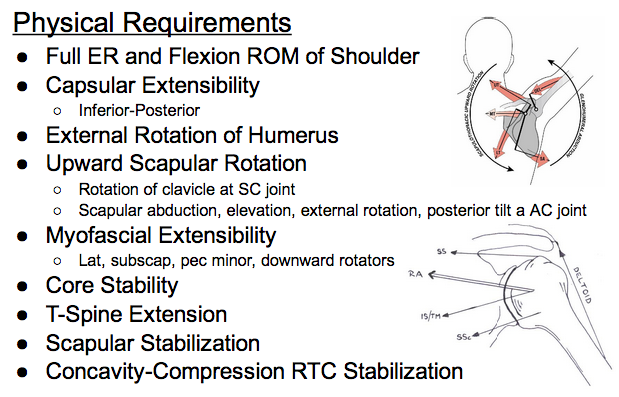 We should look at it as an important shoulder muscle that needs to be strengthened. This concept should be agitating for anyone that went to physical therapy school, as we learned about UT/LT ratio’s and how much of a problem the UT can be. To accept and utilize this paradigm shift you have to understand the true function of the upper trapezius. 1) The UT is an important part of scapular upward rotation. Many people know this, but tend to spend all their time on the LT & SA. If you only focus on the LT and SA then you are missing out on 33% of the upward rotators. How can you get someone back to full function by only strengthening 66% of their muscles? 2) Almost all the fibers of the UT attach to the posterior boarder of the distal third of the clavicle (Johnson et al, 1994). This would mean the fiber orientation would actually cause medial rotation of the clavicle, compress the sternoclaviculalr joint, posteriorly tilt of the scapula, elevate the lateral clavicle, and increase upward rotation. So have we been completely wrong all along? Yes, there can be an excessive elevation during the initial stages of shoulder flexion. So there is a movement dysfunction. But no, the UT isn’t capable of elevation with the arm at the side. The UT works synergistically with the LT and SA after the shoulder has started to flex/abduct. The excessive elevation is from the levator scapula (the main scapula elevator with the arm at the side). To make matters worse, when the upper trap is weak the levator scapulae will jump in and try to make up for this weakness. Unfortunately the LS doesn’t upward rotate, so it just pulls on the cervical spine, jacks up the scapula, and throws off all force couples. 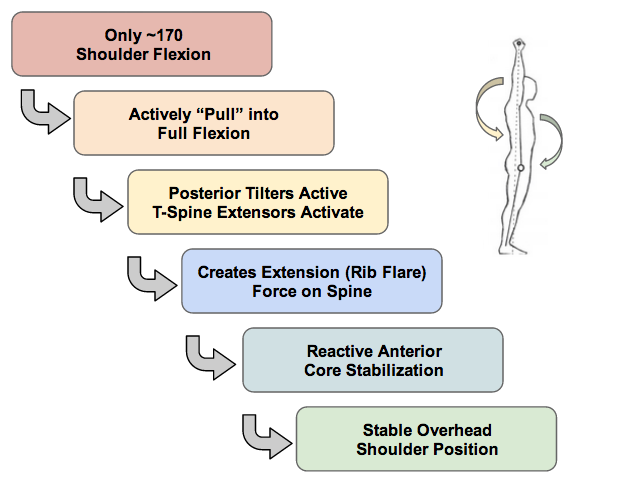 The down and back traditional treatment of shoulders may not be the best approach for all patients. Not to mention there is a great deal of benefit from training in full scapular upward rotation (i.e. increased subacromial space, UT/SA/LT strengthening, downward rotator lengthening, t-spine extension, anterior core stability, etc.). After reading this article you will have the necessary understanding to better assess and treat the overhead shoulder (part II). Johnson G, Bogduk N, Nowitke A. Anatomy and actions of the trapezius muscles. Clinical Biomechanics. 1994;9:44-50.